Document management can be a hairy task. After planning, implementing, and trying to maintain all of your organizational strategies, you can be blinded to certain efficient strategies. The video below will show you how using two complimentary document management techniques (offsite storage and document shredding) can help you better manage your company files. 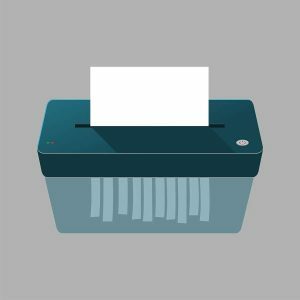 More and more businesses are taking up paperless strategies for both management as well as sales, but paper is nevertheless a reality in the business world. Many laws require keeping records for a specific period of time and businesses keep records they rarely reference as paper instead because of the money they can save storing rather than scanning. Some paper documents also can be thrown away immediately after use and don’t need to be scanned. Either way, paper isn’t going away for a while, and for now what’s important is having a safe plan for managing as well as destroying sensitive hard-copy records. Whether to save money or for whatever other reason businesses still use hard-copies, the next question to ask is how to store those records. While some files can be destroyed as soon as you’re done using them, there are just as many employee records, financial documents, and other information you need to keep around still—so how can storing off site help? Offsite storage facilities protect from physical damage with climate-controls to regulate humidity, fire-suppressant systems to prevent fires, and fire-resistant storage spaces in case a fire does occur. No one wants to think their employees would steal sensitive company info, but a recent study showed as may as 20% of breaches were caused by insider misuse. At an offsite location however, there’s no way for confidential information to fall into the wrong hands. Besides fire and employees, there’s also the chance of a break in. Facilities are monitored 24/7 with onsite guards—insurance against a committed thief that most offices won’t have. While storing in-house is free, there are still indirect costs to consider. But with storing records at offsite facilities storage comes with one flat fee and without additional baggage. No File Managers: When records are kept off site, businesses no longer need to hire an employee dedicated to manage company records—saving tens of thousands of dollars per year by removing their salary from the budget. Time Saved: 15 minutes a day looking for records seems small, but multiplied by the number of employees and word days in a year and suddenly the cost of the wasted time starts adding up. With offsite storage you spend zero time filing records—facility retrieval services handle that. Space Saved: With extra space you can swap both the cost of a file manager salary and wasted office real estate for filing cabinets and other storage areas in exchange for revenue-generating employees instead. Retention Tracking: Stored records with designated retention times—whether for legal purposes or your own—can be tracked at the facility and flagged for shredding once their retention period expires. File Indexing: Upon arrival at a storage facility records are indexed and organized for easier access. As new files are added facilities will continue to index and store records. 24/7 File Access and Retrieval: Records can be retrieved within the same or next business day, and most companies also offer emergency retrieval services when you need files urgently. Each day countless retention periods expire and records become unnecessary to keep around. For the large part those records are kept archived away in storage, and while most would assume they’d need to find a separate provider to shred them or would have to do it themselves, storage providers can do it for you right at the facility. Typically facilities either partner with a shredding provider or are equipped with their own industrial shredders, making it easy to bridge the gap between storage and shredding combining the two. What’s Your Plan for Managing What You Shred? Every company needs to shred, but some ways are cheaper and easier than others. Get help simplifying and shortening the gap between storage and shredding with Record Nations. We partner with document management professionals who will help take your organization efforts from clumsy to clean. Get free quotes from local records storage and shredding companies today!